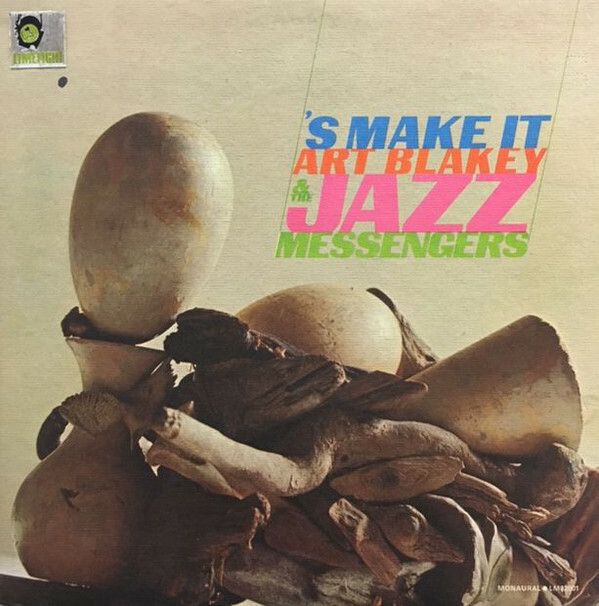 After his cutting edge group of the early sixties including Freddie Hubbard and Wayne Shorter disbanded, Art Blakey returned to a more old-timey approach with the Limelight LP ’S Make It. The end of the year 1964: the preceding half decade of Blakey’s career had resulted in a series of now legendary albums on Blue Note and Riverside with one of his classic line-ups consisting of Freddie Hubbard, Wayne Shorter, Curtis Fuller, Cedar Walton and either Jimmy Merritt or Reggie Workman on bass: Mosaic, Ugetsu, Free For All. At the time, Blakey also moved around quite a bit, recording for Impulse, Colpix and (four albums for) Limelight in the mid-sixties. A bit of jazz genealogy: ’S Make It features Blakey alumni Lee Morgan (1958-61) and trombonist Curtis Fuller, who is the only surviving member of the preceding line-up (1961-64). Tenor saxophonist John Gilmore, consiglieri of the eccentric pianist and band leader Sun Ra, had been assisted by Blakey on the unforgettable Clifford Jordan/John Gilmore album Blowin’ In From Chicago in 1957. Bassist Victor Sproles was a former bandmate of Gilmore in Sun Ra’s Arkestra. Finally, there’s pianist John Hicks, the least known of the bunch. Shaped by Horace Silver, Thelonious Monk, McCoy Tyner, infested with blues and the American Songbook, the 23-year old Hicks developed into a versatile player during his stint with Blakey in the mid-sixties. In his lifetime, Hicks played with Betty Carter, Woody Herman, Hank Mobley, Lee Morgan, Lester Bowie, Arthur Blythe, among many others. Too easily overlooked, he lead many bands as a leader and was a fixture on the American and New York scene until his passing in 2006. Hicks contributed to two other Blakey albums on Limelight, Soul Finger and Hold On, I’m Coming. You still with me? A lot of crosscurrents in the jazz family. Undercurrents too. The currency of the dollar was about the only current not too prevalent among the Beethovens and Mozarts of classic American jazz. Even if he would’ve decided to be that generous, Art Blakey hardly could’ve put up the dough to let the rearview mirror fixed of one of Barbara Streisand’s Mercedes Benz automobiles. ’S Make It is slang for ‘let’s go’. Suitable title. Symbolic for the art of Blakey : Let’s just go, bopping hard with a heavy beat. ’S Make It is a Lee Morgan tune, one of three tunes that the reluctant Sidewinder (the trumpeter allegedly wasn’t too happy with his boogaloo hit The Sidewinder of July, 1964, as it threatened to cloud his more artistically viable, advanced direction, which came to fruition in his album Search For The New Land) provided for the session. The horns play a nifty, brassy blues line, while John Hicks puts in a hefty figure on the lower keys. Blakey pushes his men forward with this trademark bombs, rolls and cymbal signals, igniting hot bits by Morgan. Fuller is fluent, more calm and collected. The other Morgan tunes, One For Gamal and Lament For Stacey, are equally bluesy, straightforward cookers. Fine fair from the still only 26-year old, handsome Morgan, three years earlier introduced by the dryly comic Blakey in Tokyo’s Sanyei Hall as ‘the world critic award winner of the Downbeat Magazine, of the New Yorker Magazine, of the Jet Magazine, of the Look Magazine and of the Ladies Home Journal Magazine…’ O yeah, and not to mention, of the Flophouse Magazine. With slight variations, the album follows these soulful procedures. The rousing Faith, driven by a solid Blakey shuffle, has an especially charming Dixie edge. John Gilmore’s smoky tenor contrasts nicely with Morgan’s sprightly trumpet in blues-based cuts like One For Hughie. A bit more sophisticated, the ballads of John Hicks and Lee Morgan, Olympia and Lament For Stacey respectively, focus on Morgan’s melancholic phrases and Hicks’ delicate runs. The John Hicks tune Waltz For Ruth harks back to the Wayne Shorter days, adding a modal section to the elongated, pretty melody. Blakey underscores the tune with the kind of hi-voltage drumming familiar from albums as Ugetsu. ’S Make It’ is a very enjoyable, undervalued Blakey album, with a line up that didn’t make it to the next record. A pity.